Edmond Good. Dime Comics. No. 11, October 1943. Commercial Signs of Canada: Cover. Bell Features Collection, Library and Archives Canada. 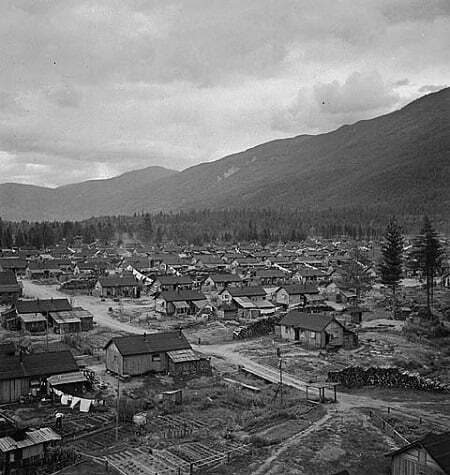 Russia occupied a strange space in the conscious of Canadians during World War II. Operation Barbarossa, Germany’s invasion of the Soviet Union in 1941, proved decisive for the course of the war, yet the USSR’s transition from foe to friend was not instantaneous. They found a reluctant ally in Canada, but fear of betrayal and hidden Communistic agendas persisted through the war. 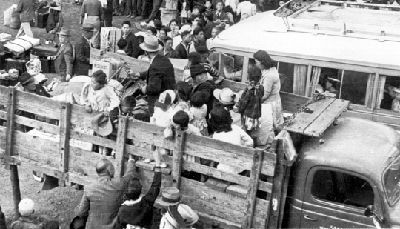 Public demand to disband the Communist Party of Canada grew and ‘Commies’ were likened to fascists and Nazi sympathizers (Caccia 162). 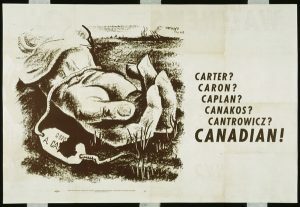 As the manpower and potential of the Red Army was realized, the Canadian government began using propaganda in the form of posters and print, radio statements, and rallies (many of which were held in Toronto) to absolve the Soviet Union’s uneasy reputation and create support for the Eastern front (164). 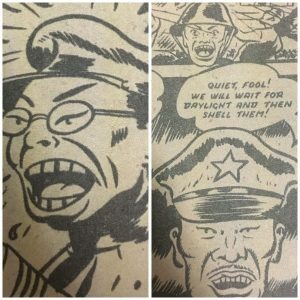 Among the variety of print medium in Canada, the comic emerged as a powerful form of propaganda and a site to build and break national identities. Published two years after Barbarossa, “The Spirit of Russia” is a continuing series in 11th issue of Dime Comics (March 1943). The story was created, written, and illustrated by one of Bell Feature’s key artists, Leo Bachle. It follows Johnny Canuck’s adventure in Soviet Russia where he is saved from the grips of a German soldier by a Red Army sniper. The sniper takes Johnny to a Russian camp where Nick, a Soviet commander, gives Johnny the new Soviet fighter plane called The Spirit of Russia to fly to Cairo. 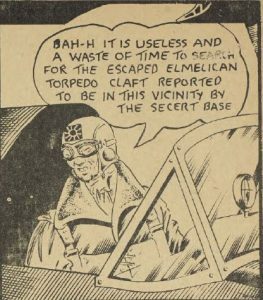 He takes down several Lufftwafte fighters on the way there and commends the plane for its flying ability (Bachle 40-46). Leo Bachle. Panel from “The Spirit of Russia.” Dime Comics, No. 11, October, 1943, Bell Features, p. 42. Bell Features Collection, Library and Archives Canada. http://data2.collectionscanada.gc.ca/e/e447/e011166574.pdf. 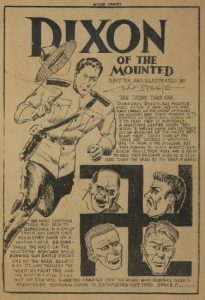 “The Spirit of Russia” belongs to a collection of comics called the Canadian Whites produced during Canada’s Golden Age of Comics from 1941 to 1946. The War Exchange Conservation Act of 1940 banned the import of luxury goods and enabled Canadian publishers to establish themselves without American competition (Bell). 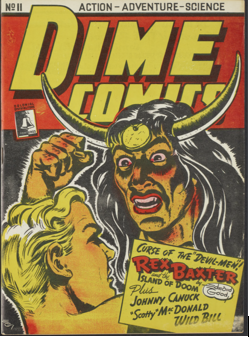 Canadian companies like Bell Features (formerly Commercial Signs of Canada), Maple Leaf, and Anglo-American published many titles including Dime Comics, Active Comics, Triumph, and Three Aces. When the ban was lifted, Canadian companies could not compete with American ones and in 1946, the Canadian Golden Age of Comics was over (Bell). The propaganda value of the Canadian Whites come from the combination of circumstance and the literary features of comic books. The War Exchange Conservation Act meant that the Canadian Whites were created by Canadian artists and writers for an exclusively Canadian audience. Where America had Superman and Captain America, Canada filled with Nelvana of the Northern Lights, Johnny Canuck, and other Canadian national superheroes (Bell & Viau). For those few years, readers of comics had something special of their own. Insulated from the outside world, they experienced the ideas and meanings shared from one Canadian to another. The comic is the medium for those Canadian narratives. Like other literary forms, they communicate through stories that allow us to find meaning in characters’ actions and words. Stories are powerful ways to communicate, and the comic transforms story-telling. Presented as an intertextual sequence of moments, a series of flashes before our eyes, they combine words and images to make content easily digestible to readers. This is especially important during times of war. War comics capture the “simplicity of human behaviour” (Hirsh & Loubert 139), a condition that makes us see evil as absolute evil and good as unconditionally good. In Comic Art Propaganda: A Graphic History, Fredrik Strömberg describes it as the way in which humans naturally see the world (9). Most of the stories in the Canadian Whites can be considered simplistic in narrative deliverance, but they are often larger than life, reflecting the experience of a war that completely enveloped the lives of Canadians. They depict the captivating adventures of superheroes doing extraordinary things. These adventures occur in the equally terrifying and exciting setting of war where the heroes can defeat outlandish villains and real-life enemies like the Nazis. 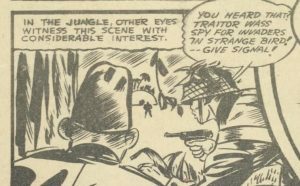 Thus, the simplistic and blatantly didactic quality of the comics resides within exciting narratives that appeal to readers because it helps them make sense of the war. 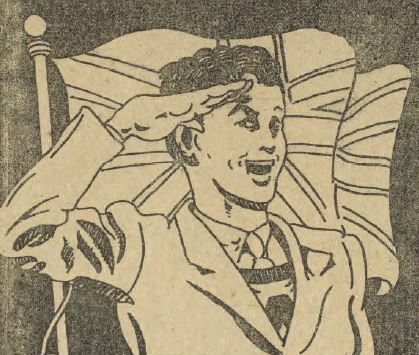 In the same way that comics transformed story-telling, the war transformed the Canadian Whites into a medium with mass appeal to propagate nationalistic messages about Canada’s position in World War II. Albert Cloutier and Eric Aldwinckle. Notre Armée a besoin de Bons Canadiens. Acc. No. 1983-30-111. Library and Archives Canada Posters and Broadsides in Canada, www.collectionscanada.gc.ca/posters-broadsides/026023-7200-e.html. 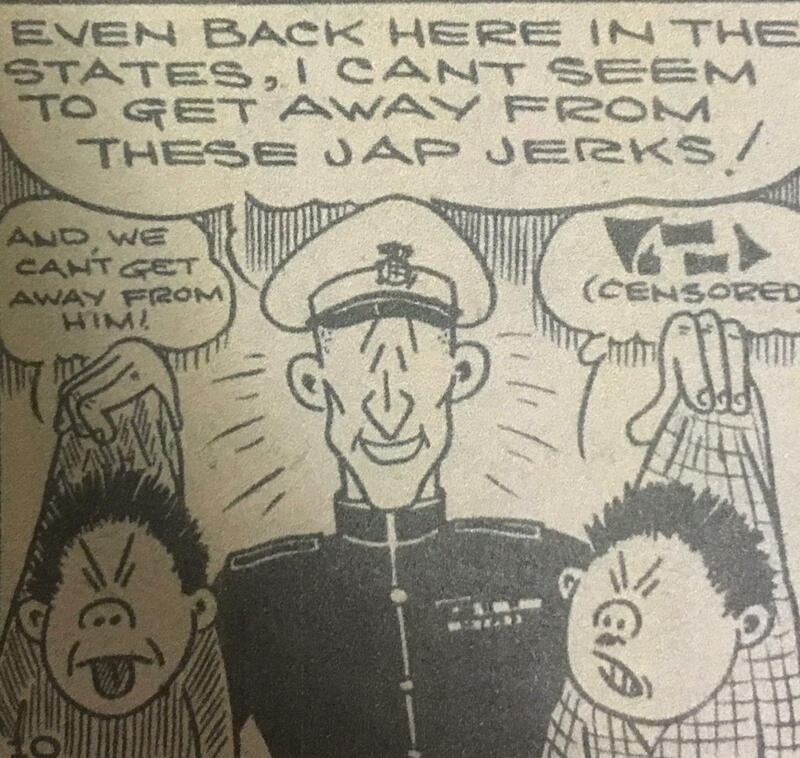 “Just one of many forms of self-expression and communication available to us” (McCloud162), comics exist among other forms of propaganda in the Second World War. Canada’s Wartime Information Board (WIB) produced propaganda in various forms. It controlled the sharing of information to promote war efforts and increase public support and moral. The poster is perhaps the most like comics. It uses a combination of image and text and often propagate war narratives in oversimplified stereotypes of good and evil. Some propaganda posters illustrate images of brave and heroic Canadian soldiers likened to other figures with those ideal characteristics, such as the knight (Cloutier & Aldwinckle). The Wartime Information Board was also heavily involved in the media. Canadian war correspondents worked within guidelines established by the WIB and some “acted as official state propagandists” (Engler 162). Articles like “Churchill, King, Lapointe Confident that Dominion Will Supply Huge Demand” (Hamilton Spectator) and “Happy Commercial and Cultural Tie is Promised with Russia” (Saturday Night) were subject to censorship regulations. Beyond print propaganda, rallies, press conferences, films and radio worked to shape public opinion to suit the needs of the country. Their strategies of persuasion and dissemination are reflected in the Canadian Whites. Like comics, traditional forms of propaganda exploit words and images, using simplicity to counter the complex emotions of war. Harry Mayerovitch (a), and Canada Wartime Information Board. Carter? Caron? Caplan? Canakos? Cantrowicz? Canadian! 1944. Acc. No. 1981-32-10R. Library and Archives Canada Posters and Broadsides in Canada, https://www.collectionscanada.gc.ca/posters-broadsides/026023-7200-e.html#cont. At the surface of “The Spirit of Russia” is an effort to bolster the relationship between Canada and the USSR. 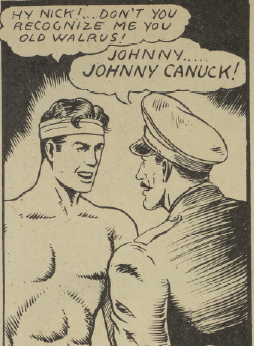 Johnny Canuck is saved just in time by a skilled Soviet sniper. A Red Army captain whom Johnny affectionately greets with “Hey Nick…. you old walrus!” (Bachle 42) is depicted as an old friend of Johnny’s. The Spirit of Russia can handle the risky flying maneuvers that Johnny performs. 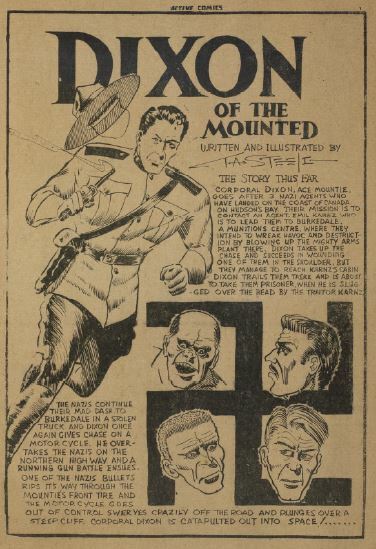 The inclusion of the USSR into the narrative of a prominent superhero reflects Canada’s propaganda efforts to improve public perceptions of the Communist nation. In 1932, the Wartime Information Board admitted that it was hard to overcome negative impressions of Russia (Granatstein 79). Polls that year indicated that 47% of Canadians wanted to see Canadian-Soviet relations improve while only 25% did not (80). Propaganda efforts to improve Soviet reputation in Canada is well-documented. Rallies were documented in news articles like one titled “Toronto’s Homage Paid to Russia At Monster Rally” published by The Globe and Mail (1942). Many posters aimed to relieve tension among cultural and ethnic groups in Canada. The positive portrayal of Russians, their skill, and quality of their war resources reflect Canada’s effort to change public perceptions of a former foe. Leo Bachle. Panel from “The Spirit of Russia.” Dime Comics, No. 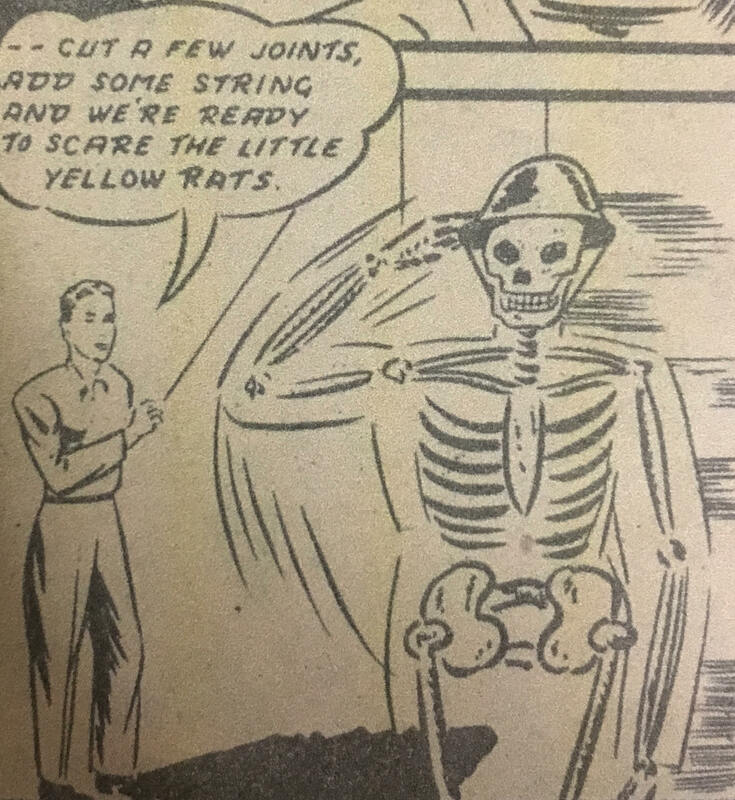 11, October, 1943, Bell Features, p. 46. Bell Features Collection, Library and Archives Canada. http://data2.collectionscanada.gc.ca/e/e447/e011166574.pdf. Delving deeper into “The Spirit of Russia”, it is evident that Russians are consistently undermined. The Russian sniper who saves Johnny’s life occupies only two frames and disappears from the narrative altogether (Bachle 41). He remains unknown to Johnny, who wakes up singularly focused on delivering his message that will help the Russians. The Soviet Captain Nick’s authority and rank is devalued in his encounter with Johnny. Upon recognizing Johnny, he dismisses the nurse’s request to order Johnny to rest. 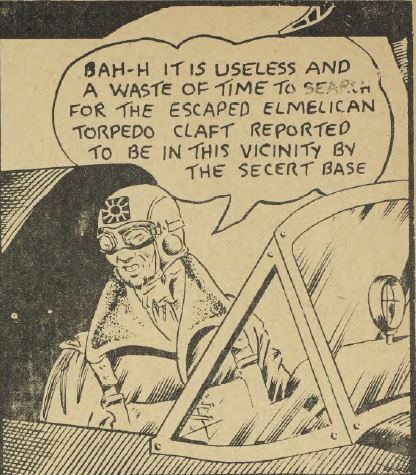 He also admits that Johnny will be better flying without a convoy, suggesting that a Russian assistance will only hinder the Canadian superhero (42). 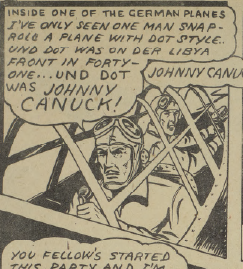 Finally, The Spirit of Russia is undermined when the Germans recognize Johnny Canuck as its pilot. The trap they set for the Russian plane is thwarted when Johnny, a threat greater than the guns of the fighter, is recognized by the enemy (46). Combined with the depiction of Johnny Canuck as the ideal Canadian, these examples reveal a trend in the simple narrative of Canadian superiority over Russia. The trend of the devalued Russian in “The Spirit of Russia” points to its Canadian nationalist subtext. However, the Soviet Union is not the only cultural scapegoat of a missing Canadian identity in World War II. 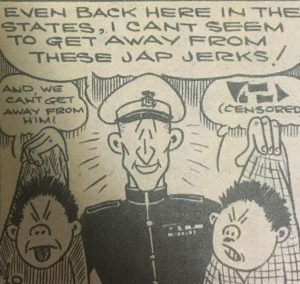 German and Japanese portrayal is often used to characterize difference in comics. They are portrayed as pure evil, lacking intelligence, morals, and in many cases, good looks. From the same issue of Dime Comics, Scotty MacDonald’s fight with the Japanese reveal them to be just that (Cooper 48-56). They fit the black-and-white stereotypes used to effectively fuel propaganda, but Russia does not. Compared to the portrayal of definite enemies, the representation of Soviets defies binary portrayals of good and evil. Tall and brave people who spoke English without an accent, they were also less than the Canadians they were allied with. 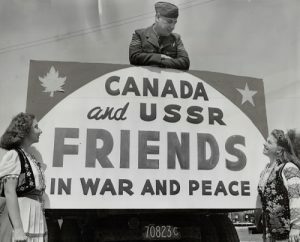 If World War II’s pro-Russian propaganda had the same undertones as in “The Spirit of Russia”, it could account for why Canadians had such little faith in Canadian-Soviet Relations. “Canada and USSR Friends in War and Peace.” Toronto Star 1945. Baldwin Collection, Toronto Reference Library, Toronto Star Photo Archive. Toronto Star License. Where nationalist subtexts did little to increase public support for the USSR, it helped build a Canadian national identity. Canada was not considered a major power in the war and it was still not independent of Great Britain. Dittmer and Larsen note that a collective Canadian identity is often thought to originate from fear of Canadian inferiority (738). Canada was ready for a larger role on the world stage, and the USSR’s position after Barbarossa proved to be the perfect opportunity. It was a large, dominating nation with a uniting ideology that bound its constituent countries together. It was also in a place of limbo between good and evil. In “The Spirit of Russia”, the Soviet characters stick out because they reside in that grey space between the stereotypical, black-and-white depictions of good and evil. The story exploits the vulnerable position of the USSR, painting Russians in colours that are deceivingly non-Canadian. It propagates an underlying narrative that Russians are only good allies because Canadians are better people. “The Spirit of Russia” creates a complex portrayal of Russians who are not evil nor completely good, building Canadian identity through a covert act of exclusion. The rise and fall of Canada’s Golden Age of Comics parallels Russia’s positive relationship with Canada. 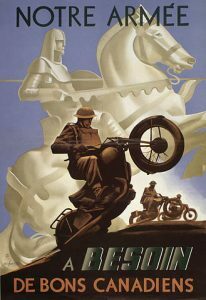 Like the Canadian Golden Age of Comics, the relationship between Canada and the USSR was held together by the weak bonds of wartime necessity, and within those bonds, Canada found a course to promote nationalism and a unique national identity. 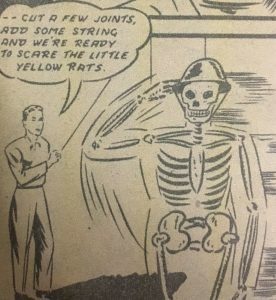 In Dime Comic’s 11th issue, “The Spirit of Russia” (1943) reflects propaganda efforts to align the public interest with Canadian nationalist ideals. In narratives that move beyond demonizing the enemy and sanctifying a former foe, the portrayal of USSR Soviets reveal how difference is manufactured as colossal gaps of disparity and minute nuances of difference to build an exclusive Canadian identity. Bachle, Leo (w, a). “The Spirit of Russia.” Dime Comics, no. 11, October, 1943, pp. 40-46. Bell Features Collection, Library and Archives Canada, data2.collectionscanada.gc.ca/e/e447/e011166574.pdf. Bell, John. “Comic Books in English Canada.” The Canadian Encyclopedia, Anthony Wilson-Smith, 8 Jul. 2015, www.thecanadianencyclopedia.com/en/article/comic-books-in-english-canada/. Bell, John and Michael Viau. “Canadian Golden Age of Comics, 1941-1946.” Beyond the Funnies: The History of Comics in Canada and Quebec. Library and Archives Canada, 31 Jan. 2015, www.collectionscanada.gc.ca/comics/027002-8300-e.html. Caccia, Ivana. Managing the Canadian Mosaic in Wartime: Shaping Citizenship Policy, 1939-1945, McGill-Queen’s University Press, 2010.
Cooper, Al (w, a). “Scotty MacDonald.” Dime Comics, no. 11, October, 1943, pp. 48-56. Bell Features Collection, Library and Archives Canada, data2.collectionscanada.gc.ca/e/e447/e011166574.pdf. Dittmer, Jason and Soren Larsen. “Captain Canuck, Audience Response, and the Project of Canadian Nationalism.” Social and Cultural Geography, vol. 8, no. 5, Taylor & Francis Group, 2001. Scholars Portal Journals, resolver.scholarsportal.info/resolve/14649365/v08i0005/735_ccaratpocn.xml. Engler, Yves. A Propaganda System: How the Canadian Government, Corporations, Media, and Academia Sell War and Exploitation, Fernwood Publishing/RED Publishing, 2016. Granatstein. J.L. “Changing Alliances: Canada and the Soviet Union, 1938-1945.” Canada and the Soviet Experiment: Essays on Canadian Encounters with Russia and the Soviet Union, 1900-1991, edited by David Davies, Canadian Scholars’ Press Inc., 1987, 75-87. Hirsh, Michael, and Patrick Loubert. The Great Canadian Comic Books, Peter Martin Associates, 1971. “Russia Anxious, Eager to Make Lasting Peace.” Toronto Daily Star, 3 Jul. 1945. Canadian War Museum Democracy at War: Canadian Newspapers and the Second World War, www.warmuseum.ca/cwm/exhibitions/newspapers/intro_e.shtml. Strömberg, Fredrik. Comic Art Propaganda: A Graphic History, Ilex, 2010. “Toronto’s Homage Paid to Russia At Monster Rally.” The Globe and Mail. 23 Jun. 1942. Canada War Museum Democracy at War: Canadian Newspapers and the Second World War, www.warmuseum.ca/cwm/exhibitions/newspapers/intro_e.shtml.